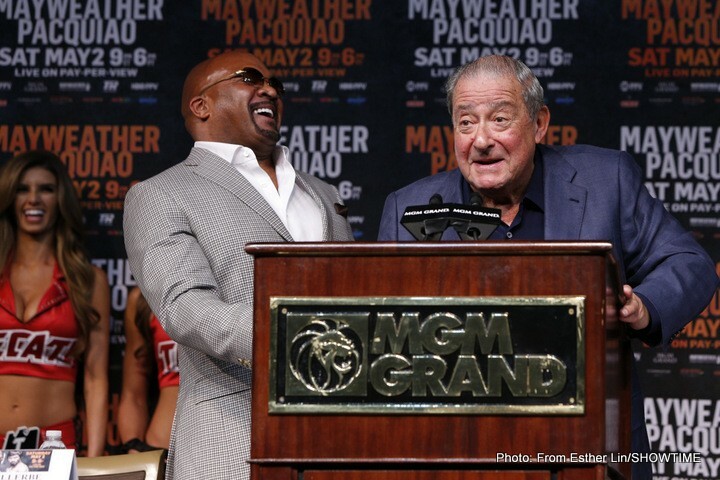 Left-Hook Lounge Mailbag: GBP/Top Rank's "PBC" Lawsuit, Mayweather WBO Title Strip, & More! Gerald N. (Delray Beach, FL): Both Top Rank and Goldenboy Promotions have initiated lawsuits against Al Haymon and the “Premier Boxing Champions” movement. What are your thoughts and what light can you shed on whether or not these lawsuits hold any weight? Vivek W. (ESB): At this stage, I think it’s far too early to really know or accurately say “how much weight” the separate lawsuits hold. There’s been a ton of information released, but with respect and integrity for the lawsuits independently, there’s still a ton of things we as fans and media simply don’t know. From the outside looking in, my position all along has been that it’s an uphill battle for the parties pursuing matters, for the simple fact that the man being pursued (Al Haymon) has the absolute allegiance of every fighter on his roster, and each and every last one of them has his back with total support. The key and primary goal of the “Muhammad Ali Act” is to do (3) things: Protect the rights and welfare of boxers, aide state commissions with the oversight of boxing, and develop sportsmanship and integrity within boxing industry. Take a very close look at those things mentioned, and you’ll immediately form an understanding for my initial thoughts about this being an “uphill battle” for those parties pursuing the matter based on “absolute allegiance of every fighter on [Haymon’s] roster. Every single fighter on the Haymon roster has an actual bond with him that seems to go well beyond the ring. It’s almost more of a mentor type slant, and it only strengthens his position. But lets dig a little deeper. When you read the fine print in its entirety of the “Muhammad Ali Act” and the Congressional response to why it is necessary to enforce, it gets much more specific, touching on key gray areas in the sport. To name a few: There are no restrictions placed on contracts that boxers agree to with promoters and managers; there is major interference in the sport as a result of open competition by restrictive and anti-competitive bodies that refuse to work with one another; and promoters are not being punished, as a result of certain states being more lenient about legal terms in the contracts. Those three areas are very pertinent to the problems we see pretty actively in the sport today. Trouble is, as we analyze each of those things, if we were to put them in a sentence with a blank line, the reader may have a very hard time trying to identify whom it applies to, as they are ALL being done to some level by each of the men involved. In example, the part about the “interference as a result of open competition by restrictive and anti-competitive bodies that refuse to work with one another” (paraphrased). Critics will say “Haymon has only allowed his fighters to fight on PBC affiliates, but have refused to let them fight on HBO or fight HBO fighters. Although that theory isn’t totally true, is it not factual that both Oscar Dela Hoya and Bob Arum refused to work together for years, which actually catapulted the ‘cold war’ of networks and fighters? So how can that be levied in one direction but not observed in others? Again, there are many elements of these lawsuits that have enough girth to mount an attack, but when you strip the nuts and bolts and get down to the basics, neither side is doing anything that the other hasn’t been guilty of themselves? This includes the Anti-Trust Act and the stipulations surrounding it, as well. The only foreseeable challenge that could prove to be too difficult to evade is 15 USC 6308, which deals specifically with “CONFLICTS OF INTEREST”. In this specific code, it says verbatim: “It is unlawful for (A) a promoter to have a direct or indirect financial interest in the management of a boxer; or (B) a manager (i) to have a direct or indirect financial interest in the promotion of a boxer; or (ii) to be employed by or receive compensation or other benefits from a promoter, except for amounts received as consideration under the manager’s contract with the boxer. While I can see a clear path to the Goldenboy/Top Rank angle, as it relates to Haymon potentially having direct financial interest in the promotion of a fighter, I think this practice can also be levied against those in pursuit, as each of us have seen situations where a given promoter has opted not to take certain fights with credible opposition to protect paths to bigger paydays (which benefit them) against other opposition. This practice is a total parallel to the very act being charged. The only difference is that the person being accused found a more creative way to do it, which has resulted in absolute allegiance from the fighters on his roster; while those opposed to his method have seen lawsuits and challenges from several of the fighters on their rosters. At its best, there are highly educated legal teams on both sides that will have much more than a few paragraphs to present their cases. I think the legal system will hear them, and I think the due process will manifest. But at the end of the day, I just see it all coming down to the fact that everything about the accused movement supports and benefits the fighters, which is something no other promoter/manager in this era can boast. The state and/or government doesn’t currently have a jurisdiction in place to condemn that in isolation without finding the same fault in the accusers. This truth gives the Haymon movement some level of benefit equivalence, as the acts are basically the same. That, in and of itself will make this effort a very tough one to pass. And it doesn’t help that there was a contractual clause between the parties involved that required this matter to go before an arbitrator, as opposed to an actual judge. I just don’t see how this effort will pass….but I’ll be tuned in while it last…. Herman G. (Covina, CA): What are your thoughts about Floyd Mayweather being stripped of the WBO belt that he won facing Pacquiao? Vivek W. (ESB): Personally, I think it’s a non-story. It’s nothing short of hilarious watching local news stations and even the ESPN’s of the world talk about this as if it actually holds merit. Anyone who has been around the sport for even a little bit of time knows that the WBO sanctioning body holds very little weight, if any, in the mind of those operating in and around the sport. A sanctioning fee of $200K is absolutely ridiculous. Doesn’t help that it was requested from a sanctioning body so aloof that it was actually found culpable of moving a deceased fighter up it’s rankings just a few years ago. Talk about sleeping at the wheel! How’s that happen??? At the end of the day, considering their limited value, the WBO should actually consider paying Floyd Mayweather $200K to wear their belt. The Puerto Rico based organization went about this in a very wrong way. And the shame that has ensued on the flipside is well warranted. This is just another reason why the sport desperately needs to limit some of the ‘alpha-belts’ and organize this mess of a sport. It’s very unfortunate and pretty embarrassing. (Vivek “Vito” Wallace can be reached at 754.307.7747. He can also be contacted via Twitter (@lefthooklounge1), Instagram (ViveksView), and Facebook). Next boxing news: Shane Mosley and Ricardo Mayorga To Go At It Again! You are here: Home / Boxing News / Left-Hook Lounge Mailbag: GBP/Top Rank’s “PBC” Lawsuit, Mayweather WBO Title Strip, & More!